Match ANY antenna to 50 Ohms! This is my antenna tuner. Build an antenna tuner yourself! You can save money and brag about it! This antenna tuner utilizes an L network impedance matching system. It also acts as a low pass filter. Here's the schematic. 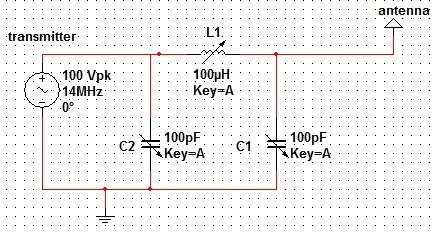 Technically this schematic depicts a pi network, but Depending on your antenna one of the two capacitors can be eliminated for lower cost to make the L network. you can use any reasonably sized roller inductor and variable capacitors for this project! When you're done just use an SWR bridge to set your inductor and capacitor(s) and you're ready to get on the air!